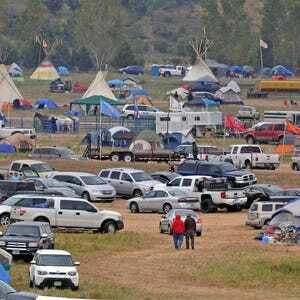 Sen. Bernie Sanders, Native Americans protest pipeline - We Resist. Sanders interpreted Warren’s memo — which states “the right of way for the entire pipeline has been obtained” — as a refusal to halt construction while a new review takes place. A company spokeswoman said in an email, “We will construct only on land where we have the proper permits and approvals.” She did not say if the company would comply with federal officials’ request for a “voluntary pause,” or if it would pursue construction on federal land that federal officials now say they won’t authorize during a review. At Tuesday’s protest, Jasilyn Charger, 20, of the Cheyenne River Sioux Tribe, grew tearful while telling the crowd “there will be no warning for my people” if the pipeline breaks and pollutes their water. She and other tribal youths recently ran 2,000 miles from the Standing Rock Reservation to Washington to protest the pipeline.